Patrick Billingham looks at issues arising from playing outdoors. After what has seemed like a very long Winter, Spring has finally arrived. And with it the start of the festival season. The Brighton Festival and Fringe, Love Supreme among others around the county. Warmer conditions also encourage those gigs which bring live music to the wider public. Outdoor events. Weather permitting. Moisture and electronics have a mutual affinity. Which is not beneficial to any band relying on some form of amplification. Rain can be a big problem. If it’s not possible to keep microphones, amplifiers and leads dry, the gig must be cancelled or abandoned if it has started. Much depends, as illustrated by the photographs, on the nature of the space reserved for the band. I have performed on patches of grass or a stage made of pallets on the street, neither with any weather protection. I have performed where a gazebo provides protection for some of the band. I have performed where a marquee provides protection for all the band and even some of the audience. Then there are permanent structures such as bandstands. Some, like The Birdcage Bandstand on the Hove seafront are open to the elements. Others, like Eastbourne Bandstand have a covered enclosed stage with a back wall facing the prevailing wind. Which, even with wall to wall sunshine, can be another hazard to the smooth running of the outdoor performance. I recall a sunny June day at the Kemp Town Carnival a few years ago. 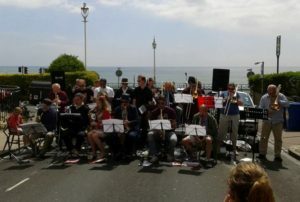 The Sussex Jazz Orchestra were playing in a street adjacent to the sea front. The prevailing wind was on shore force six. With gusts. Exacerbated by the effect of the nearby tall buildings. And some trombone parts were observed disappearing over nearby roofs. But it wasn’t all bad news. Firstly, the SJO has a digital archive of all our charts, so they could be replaced. Secondly, the charts fell back to earth in Eastern Road. At the feet of someone who recognized them for what they were, heard the band, followed his ears, and returned them, apparently unharmed by their experience. The good news was that he joined the band as first trombone and brought along some fresh arrangements. Bad news was that, before we could incorporate them into the pad, he went on holiday. And on his return was met by immigration officials and deported. At this point, let me put on record that, as a band manager, I have no intention of complying with the 2014 Immigration Act. Acting as an unpaid Home Office informant by checking the immigration status of my fellow musicians. Back to the problem of playing al fresco under windy conditions. A small group may well have a repertoire of standards, which they have more or less committed to memory, and don’t need the actual charts. Big band musicians, on the other hand, rely on the music on the stand where it can be read. Wind has a tendency to separate one from the other. The ease of putting up the next chart, putting the previous chart away and the time taken to do so, is an important factor when considering ways of keeping music and stand together. If it takes minutes rather than seconds, in very windy conditions, the band may end up playing only about a half of the planned set. With the band announcer meanwhile having to keep the audience engaged. Whatever method is used, it is a good idea to keep handy, clothes pegs or clips of some description. Preferably with a long reach. Ways of dealing with the problem of aerodynamically inclined music will be referred to in a future column. Especially those that you have found effective. Please let me know about them. Next month: Hopefully news about the big bands based in, and appearing in, the county, and another band profile. If you would like your band featured, and I have not already contacted you, please get in touch. Or if there is anything else, such as gig news, or feedback on this column, that you would like me to include in May’s Big Band Scene, please send it to me by Friday May 25th. My email address is g8aac@yahoo.co.uk. 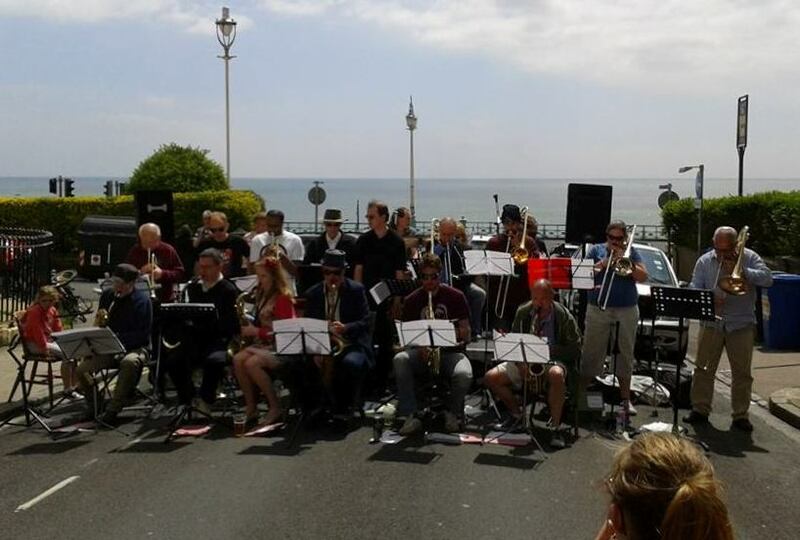 8:00 – 10:30 pm, Brighton Festival Fringe: The Round Georges Jazz Festival; Terry Pack’s Trees at The Round Georges, 14-15 Sutherland Road, Brighton BN2 0EQ, (01273 691833). Free entry with collection. 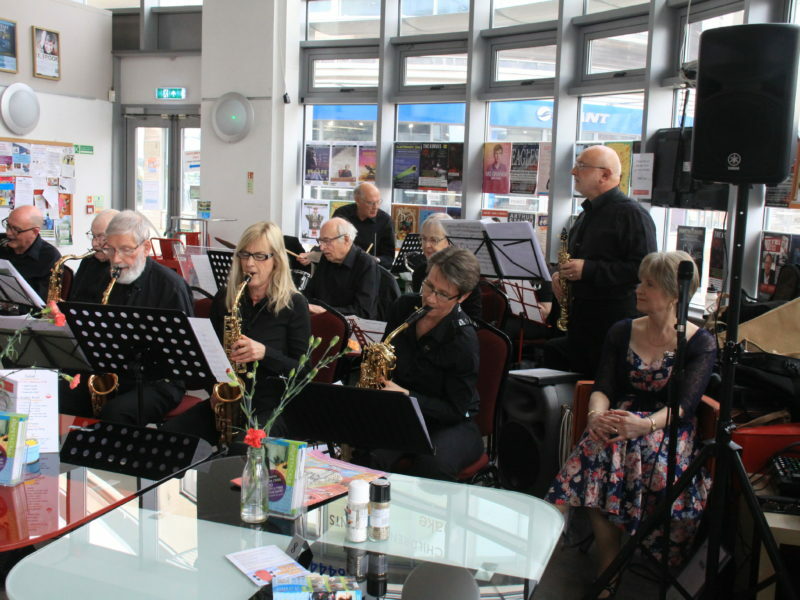 8:00 – 10:30 pm, Brighton Festival Fringe: The Round Georges Jazz Festival; The Sussex Jazz Orchestra at The Round Georges, 14-15 Sutherland Road, Brighton BN2 0EQ, (01273 691833). Free entry with collection. 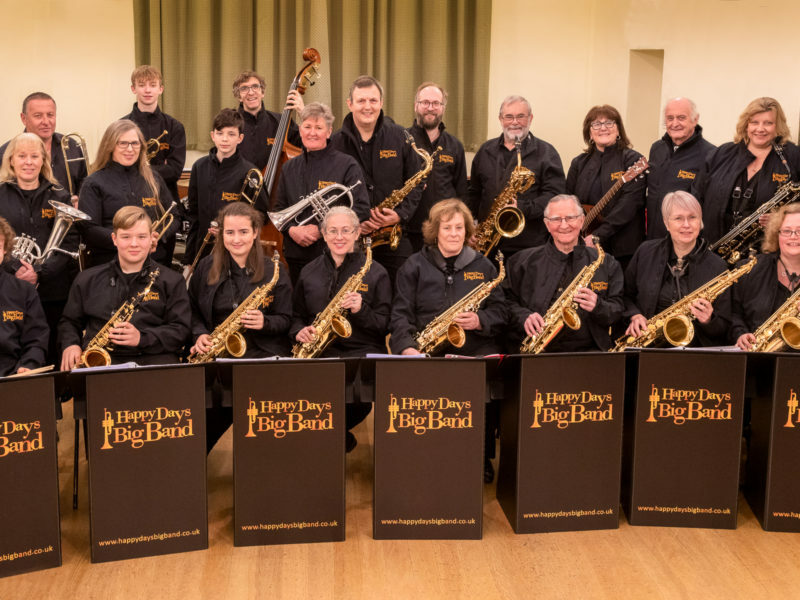 8:00 pm, Pete Cater Big Band featuring music made famous by Buddy Rich at Frant Church, High Street Frant, East Sussex, TN3 9DX (01892 752261). £18 from Frant Stores/Brittens Music Shop Tunbridge Wells or online www.wegottickets.com or Paul Barber (01892 750665). Tickets also on the door if not sold out previously. In aid of the conservation of Frant church. Doors open 7:30 pm. 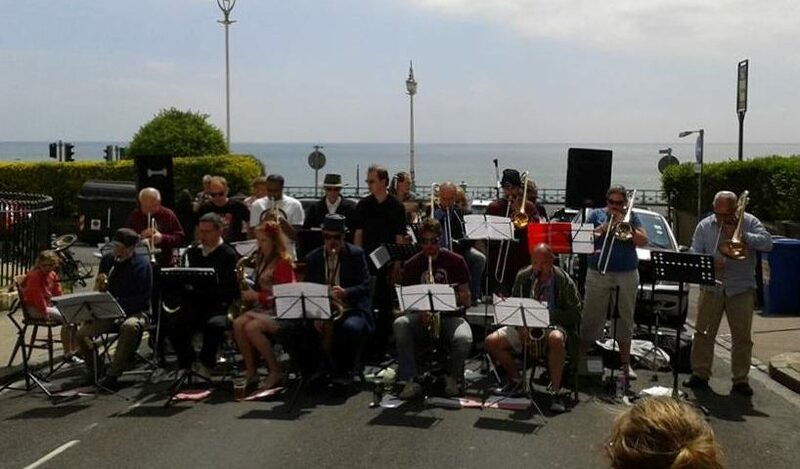 1:00 – 4:00 pm, Brighton Festival Fringe: Brighton Jazz Mafia Big Band Swingin’ at The Spiegel at Brighton Spiegeltent, Old Steine Gardens, Brighton, BN1 1GY (07941 971411). £12.50/£11. 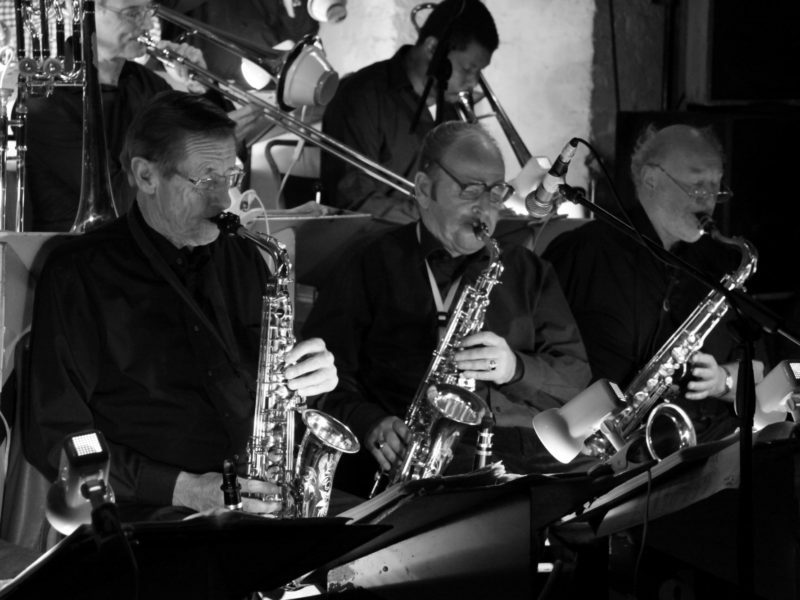 [R] 12:00 – 3:00 pm, Groovin’ High Big Band at the Ravenswood Country House Inn, Horsted Lane, Sharpethorne, West Sussex RH19 4HY, (01342 810216). Free entry. 8:00 pm, The Mark Travers Project presents Thelonious Monk at The Ropetackle Arts Centre, Little High Street, Shoreham-by-Sea, West Sussex, BN43 5EG. (01273 464440). £15. 12:30 – 3:00 pm, The Perdido Swing Band at Staplefield Village Show, The Village Green, Staplefield, West Sussex RH17 (01444 450335). Free entry. Tuesday 29th May – Saturday 2nd June. 7:30 – 9:50 pm, (also 2:30 – 4:50 pm Wednesday & Saturday) The Rat Pack Live From Las Vegas, with Big Band, featuring a celebration of Ella Fitzgerald at The Hawth, Hawth Avenue, Crawley, West Sussex RH10 6YZ (01293 553636). £24.50 – £37 (depending on the performance).